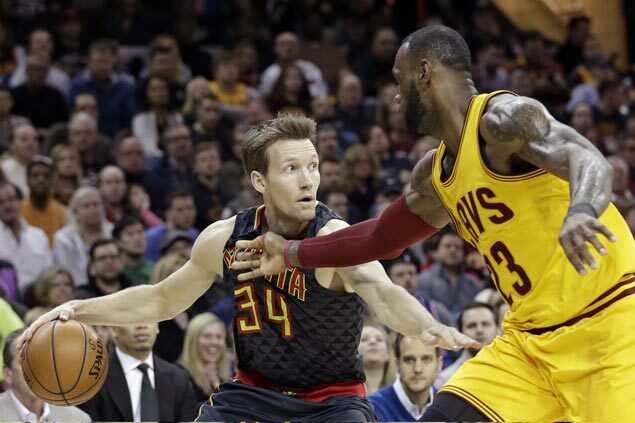 Mike Dunleavy’s arrival to the Atlanta Hawks this January was peculiar to say the least. On Jan. 5, reports surfaced that sharpshooter and fan favorite Kyle Korver was getting traded to the Cleveland Cavaliers. Korver sat out that night’s game in New Orleans and gave an emotional meeting with the press about leaving the city of Atlanta. On Jan. 6, details of Dunleavy being included in the trade became available to the public. On Jan. 7, the trade was officially announced, but Dunleavy never actually reported to the Hawks. Reports began surfacing on Jan. 9 that Dunleavy wasn’t reporting to the Hawks because he was seeking a buyout to play for a championship contender. Dunleavy said the same day that he was going to report to the Hawks and once he joined the team, he claimed to the media that his family needed time to move. Rolling is exactly what Dunleavy did his first week with the Hawks. In his debut against the Celtics, he shot 2-for-3 from three-point range and knocked down a huge three for the team with 2:11 remaining in the fourth quarter to cut the Celtics lead to two. In his second game against the Milwaukee Bucks, he scored 20 points on 4-for-5 shooting from three. Philadelphia 76ers center Joel Embiid even sarcastically commented under the NBA’s Instagram post of Dunleavy if he was “better than MJ?? ?” Not only did he seem to replace Korver’s role early on, but given Korver’s recent productivity, age and contract, the Hawks seemed to have gotten a steal in Dunleavy. Dunleavy missed 14 games towards the end of the season, however, missing 12 games due to a nagging ankle injury and just not getting any playing time in the other two games. He scored 20 points again in his return to Cleveland in that shocking Hawks win without the team’s starters. In the playoffs, Dunleavy only averaged 8.8 minutes and two points a game, shooting 40 percent from three-point range. Overall, Dunleavy was only called upon by the Hawks a few occasions after his initial offensive boosts he gave the Hawks his first week with the team. Per 36 minutes in Atlanta, he averaged 12.8 points, 5.2 rebounds and 2.3 assists. Korver is now struggling on basketball’s biggest stage in the finals, shooting 1-for-6 from three-point range in the series’ first two games and even went scoreless in 19 minutes of action during Game 1. The Hawks traded one declining 36-year-old three-point shooter for another, but Atlanta perhaps got the better end of the deal getting a cheaper contract in Dunleavy as well as a potential 2019 first round draft pick. Dunleavy didn’t have a great season, but for what was expected from him, he did relatively well.